Vegan Asian-Inspired Recipes are perfect for entertaining or enjoying any night of the week. They are vegan, gluten-free, and healthier than most dishes you’ll find at restaurants. And they are all delicious and easy to make! I grew up going to a lot of Asian restaurants. A lot of them weren’t authentic, but I loved the food. There were a wide variety of cuisines to choose from, such as Chinese, Vietnamese, Thai, Japanese, and Indian. And the flavors and ingredients I tried remain some of my favorites to this day. I still love having Asian food on holidays, but now I often make it myself instead of going to a restaurant. Sometimes it’s nice to relax at home instead of driving somewhere, and I like knowing exactly what ingredients are going in my dishes so I can make them healthier and use less or no oil. Plus you can invite your friends and family over and have everyone bring a dish! These Vegan Asian-Inspired Recipes should help get you started. It’s always nice to start with a bowl of comforting soup. Spicy Coconut Soup is one of my favorites, and it’s ready in no time. 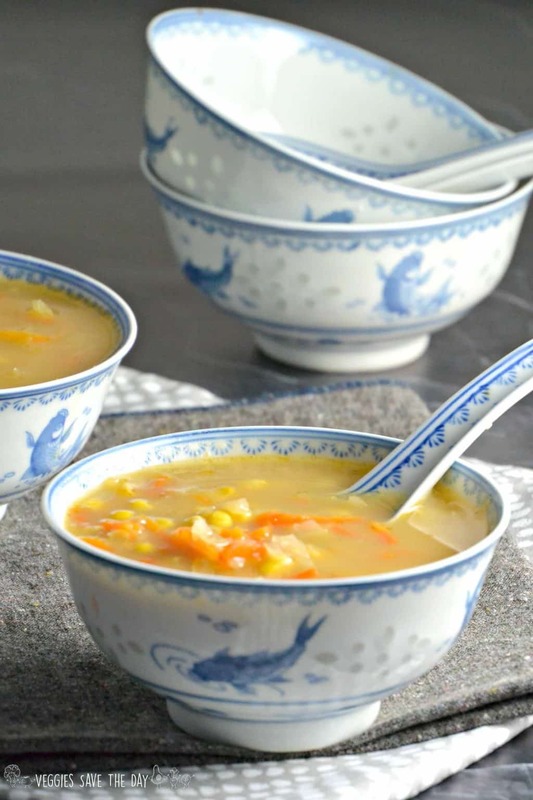 Indo-Chinese Corn Soup is another great starter, and you can make it in the Instant Pot! I also enjoy serving a delicious appetizer like Mango Tofu Summer Rolls with Spicy Peanut Sauce. Vegan Lettuce Wraps are another great choice. Or you could go with Burma Superstar Tea Leaf Salad. And for a main course, you can’t go wrong with noodles! I love Peanut Butter Noodles or Pad Thai. But fried rice is also a classic! 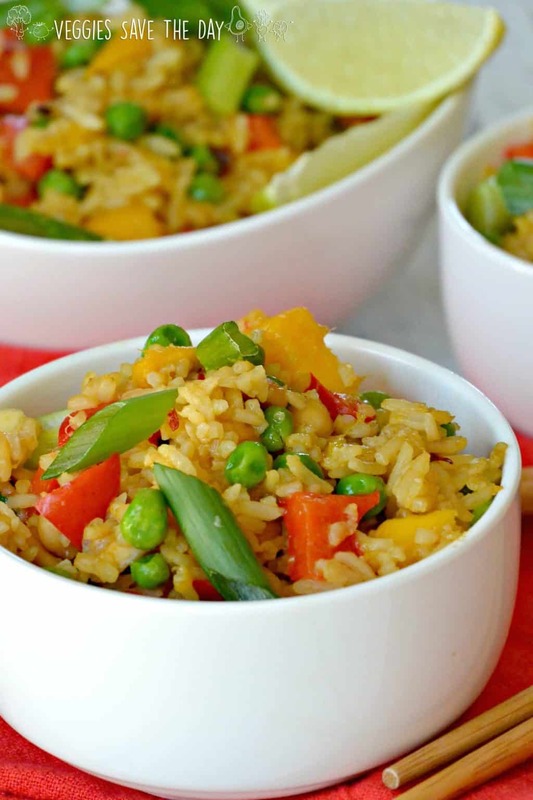 I love Spicy Mango Fried Rice because it’s flavorful even though it’s oil-free. 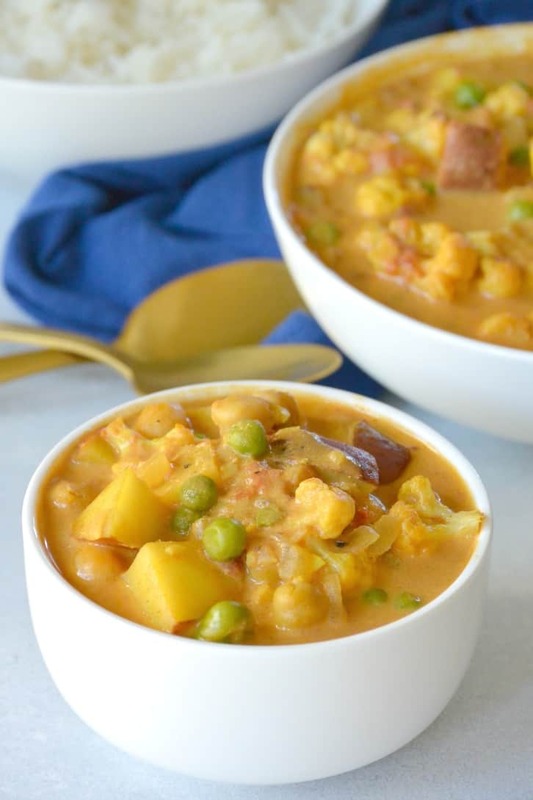 Chickpea Curry is another favorite Vegan Asian-Inspired Recipe. And it’s even better the next day! 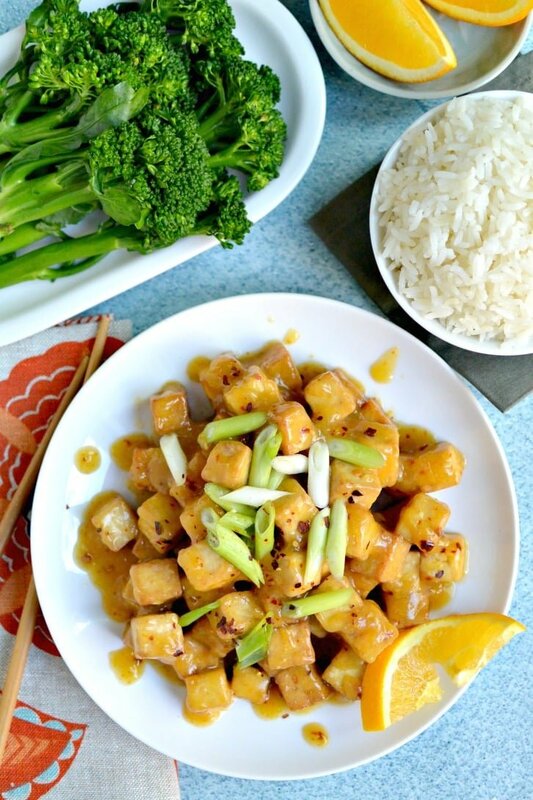 You’re definitely going to want to break out your air fryer and make this Orange Tofu. The tofu is crispy without using any oil, and the sauce is a delicious combination of sweet, sour, and spicy. And everyone will love Peanut Sauce Tofu! It’s one of my all-time favorite recipes. I hope you have enjoyed these Vegan Asian-Inspired Recipes! If you make any Vegan Asian-Inspired Recipes, or any of the other recipes on the website, I would love to see your creations! There are so many yummy recipes here! That peanut sauce is calling my name. Thanks Dianne! I love peanut sauce! I want to try all of them! They look and sound amazing! Colorful! Nutritious! Delish! Ooh I love this roundup! Everything looks delicious, Amy. It all looks so delicious! Peanut based sauces are definitely my weakness! What a wonderful collection! They all look so yummy! These sound wonderful, thanks for the great roun up! You just made me super hungry right now. Coconut milk soups and tofu stir fries… I think I could eat these for the rest of my life and be happy 😀 I’ll check out all the recipes, thank you!!! Thank you, Francesca! We eat these recipes at least once a week in my house!